It’s safe to say that my husband and I have been in a date night rut since winter’s nasty arrival. So I decided that we needed to reinstate our Saturday date night and do something, anything, a little more creative to have some fun together and relax. I put together a date night printable to hang on our fridge. I thought about some of the dates we’ve gone on in the past and some of our favorite things to do together. 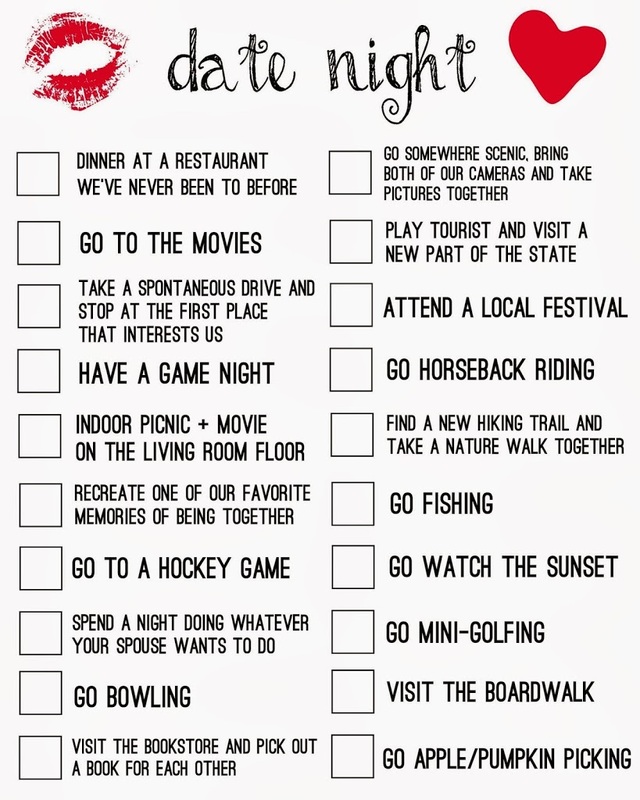 I created a checklist of 20 date night ideas. As we complete them, I hope to check them off and not repeat a single idea until we’ve done every one of these things and it’s time to print out a new sheet. I’ve talked about this list with a few people and they thought it was a great idea. So now I’m sharing my list with you! As my husband and I complete this list, I’ll blog about our dates each week. I’ll be sharing our first check mark on this list on Friday. I also asked readers on my Facebook page to tell me what their favorite thing is to do on date night. Sabine C. said, “I love to walk on the beach and just relax and enjoy the company of each other.” Tawny Y. said, “Actually sitting at home cooking and watching a movie! Sometimes we don’t wanna get out I’m traffic. To some it’s lame, but not to us, we are together regardless.” Thanks for your answers, ladies! If you have any other date night ideas, I would love to hear about them!